Throughout your childhood, you pieced your Legos into shoddy weaponry of all sort -- but now that you're grown up, it's high time you took your fake guns more seriously. Get strapped, with BrickGuns. Created by some dudes in Texas and assembled completely from stock Lego parts, BGs're fully-decked-out gats so accurately dimensioned/detailed, they'll get you shot by even the most competent police officer. Right now, they're offering four pieces, including two Glocks, a Beretta, and an IMI Desert Eagle, all with fully-functional triggers, magazines, slides, hammers, and safeties -- because you wouldn't want to accidentally fire a Lego gun that shoots absolutely nothing. 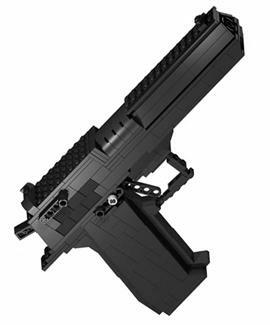 With each firearm, you'll get all the necessary pieces (including Lego-specific rubber bands for mechanical articulation) and instructions for constructing your plastic-steel, including detailed guidance like "resist urge to stick up nose". You can also download PDFs that'll guide you through the construction of slap-on-able "scopes", "laser" sights, and field "lights" that you can piece together with your own Legos at home -- because sometimes, taking things seriously requires pretending you see a red dot on the Black Knight's forehead.